Home / Unique photo ideas for your wedding! Unique photo ideas for your wedding! At Wedding Letter Hire we’ve got a lot of experience in the wedding industry, and one thing we have really noticed over the years is a big change in what couples want from their wedding photography. Gone are the days of staid, traditional photos with formal shots of family groups. Nowadays brides and grooms want a far more relaxed feel to their photography – and they really want the true essence of their happy day captured on film. Hiring a professional photographer for your wedding is a big investment, and so it’s important to get those pictures exactly how you want them. Here’s our guide to some great photo ideas that will be the perfect memento of the best day of your life! Getting engaged is a really exciting time for couples and it’s no surprise that they want to capture the moment with an engagement shoot. This is usually an informal shoot of the couple and is often done either in the location where the proposal took place or in a place that has an individual significance to the bride and groom. These photos are really special and it’s lovely to have the start of your life as a married couple captured on film. Many photographers include an engagement shoot as part of their wedding packages and it’s also the ideal time for your photographer to get to know you and get a sense of how you want your wedding photographed. Many couples choose to individualise their photos by adding some props to really make them stand out. Fun wedding photo booths are really popular and guests love them too – especially the kids! 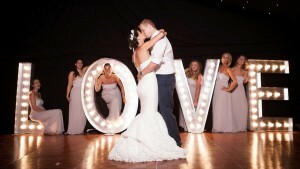 People have also told us how much they love our giant light up letters and how great they look in their wedding photos! They are the perfect backdrop for a photo and, standing 5ft high, our illuminated letters are even big enough for you to sit in or lean against for that perfect photo opportunity. 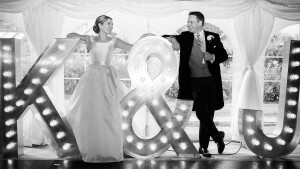 Light up initials of the happy couple and the word LOVE are really popular and look great in both engagement and wedding shoots. As you can see there are lots of great wedding photo ideas out there and it’s important to choose one that reflects your personal style. Remember you are going to be looking at them for years to come so take the time to find a photographer that you will feel happy and comfortable with to make sure that you get the images that you want of your wedding. ← 2016 Summer Wedding Trends!